Should you dress up to go to the opera? Unlike some other companies, Minnesota Opera hasn't taken a position on the question. They haven't felt they need to, said Minnesota Opera president and general director Ryan Taylor. Some traditional operagoers, Taylor said, feel they need to clearly state, "This is a substantial piece of art, and it requires respect, and respect means that you dress a certain way." Those messages are primarily directed at younger operagoers, but Taylor thinks that's unnecessary. "Some of the best-dressed audiences that you will ever see at the opera are student audiences," Taylor said. "They get excited that they're doing something they know is extraordinary." The bottom line, in Minnesota, is "making sure that the environment is one that's inclusive and comfortable for people to come in whatever way they find appropriate." Understanding young audiences is key to engaging them, say Taylor and his colleagues — but, they add, connecting their art form with new audiences doesn't just mean catering to millennials. Only a small fraction of all Americans attend opera in any given year, so there's room for growth across all demographics. 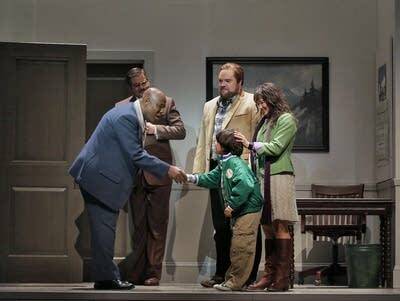 Minnesota Opera has recently been acclaimed for its New Works Initiative — responsible for new operas like the Pulitzer-winning Silent Night (2011) and last year's blockbuster The Shining, which Minnesota Opera's audience engagement manager Kristin Matejcek said filled almost half its single-show seats with people who were new to opera. Those operas share seasons with longtime favorites like Puccini's La Bohème and lesser-known classics such as Donizetti's Don Pasquale. Noting the success of The Shining, Taylor said that conventional ideas about how new audiences approach opera are too simplistic. When he hears the statement, "Opera has an image problem," it typically means that "someone who loves the art form has run into someone who doesn't know anything about it, whose image is from a Bugs Bunny cartoon or a pasta commercial. Our job is not to convince everyone, but to take stepwise motion and change as many minds as we can in a given season." Every classical music organization peppers its programming with new works and other shows that might attract attention outside their typical audiences. The Minnesota Orchestra, like many symphony orchestras, has had huge success with live performances of the scores to accompany movies like Harry Potter and the Sorcerer's Stone. The Saint Paul Chamber Orchestra has a Liquid Music series that sees the organization collaborating with the likes of Devendra Banhart and Poliça. To sustain their organizations, though, these companies need to build relationships. "If you just do Bohème, if you just do Aida," explained Minnesota Opera chief marketing officer Darby Lunceford, "it doesn't bring anybody closer to the art form. You really have to have it balanced, to understand how to keep people in the fold and get them into the habit of coming." Of course, you're more likely to invest your time in classical music if you understand how it works — and especially if you've personally participated. That's why Minnesota Opera has education programs like Project Opera, which produces an entire kids-only opera every year. At the other end of the spectrum, the Voices of Opera program welcomes singers over age 55 to learn and perform operatic choruses. Both programs may lead to live performances at full professional productions. "We've got access points," said Taylor, "anywhere from five years old until you are no longer on the earth. I don't know that there's any other opera company out there who can boast a learning curve that's designed for anyone at any age." Okay, but we're not all going to be opera singers — even at the amateur chorus level. How do you get young adults, or anyone, to take a break from all the big-buzz TV shows and come out to hear live classical music? "It's real easy to sit on the sofa," acknowledged Lunceford. "It's always interesting when someone says, 'Opera is too long' [...] yet you sat and binge-watched Downton Abbey for 12 hours." Like many organizations — from the Minnesota Orchestra to the Minnesota Zoo — Minnesota Opera has a program specially tailored for young adults. The opera's program, called Tempo, provides discounted tickets as well as exclusive parties and chances to meet musicians. Unlike some comparable programs, Tempo comes with an annual membership fee ($50). "We're saying to that generation," explained Lunceford, "membership is important." Even with the membership fee, Tempo tickets are a bargain — but while economic accessibility helps, opera staff understand that price isn't the make-or-break factor it used to be. Increasingly, attracting audiences to performing arts events means helping them envision the full experience of an evening out. "This company has always been really high-quality" when it comes to what's on stage, said Lunceford, "but everything around it matters now — from parking to walking into the theater to who you're going with and where you go have dinner." To that end, the opera partners with local restaurants to offer special pre-show meals. "Taste of Opera is an all-inclusive day or night out," explained Matejcek. At the meal, "a classical radio host will do a panel discussion with people from our creative team. The restaurants market to their people, so that brings in new audiences." Diversity is a special challenge for any classical music organization: There's no getting around the fact that most of the repertoire was written by dead white guys. "We're working on a newer engagement model about community consensus-building in the arts," said Lunceford. "How [do we become] less of an organization that produces and pushes out to the community, but actually goes to the community, talks with the community, and understands where we intersect?" One consistent interest of new audiences today, staffers say, is to have the artistic process opened up: to feel like they're understanding, even participating in, the excitement of opera. "There was this facade of, 'We'll put on the show, and you come see it,'" said Lunceford about the old-school approach to opera. "That's not how people act now. They want to see everything. They want to get connected to the singers. They want that access that used to be saved for board members, but now you have to open it up." Several years, ago, the opera started opening selected dress rehearsals to bloggers — who are invited not just to write about their experience after the fact, but to have their phones out and share updates as the show unfolds. "One of our main social media preview night people," observed Matejcek, "will come and tweet about the opera, and then she leaves that and goes to First Avenue to see a show. The people that follow her are watching her go from opera to a show at First Avenue, and they're like, 'Oh, if she likes that, might I?'" This article was produced as a part of a collaboration between Minnesota Public Radio and The Growler, a monthly craft beer lifestyle magazine covering the best stories in beer, food, and culture. Find this article online and in print in the June edition of The Growler.